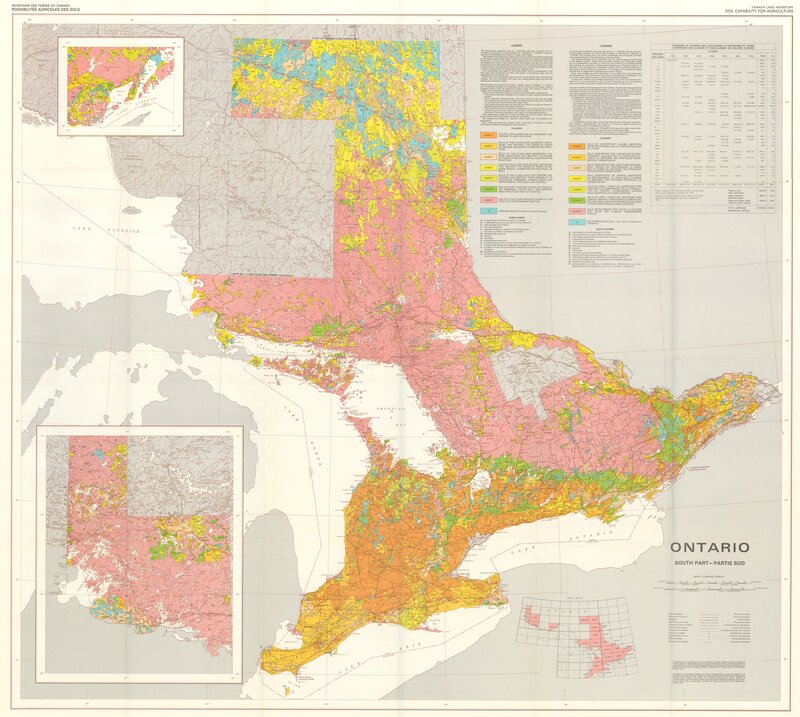 In the 1960s, the Government of Canada realized the importance of mapping the country for resource management. The resulting Canada Land Inventory (CLI) is a multi-disciplinary land inventory of rural Canada. According to the CLI, there are seven classes of land denoting suitability for agriculture: Class 1 is the most suitable for agriculture; Class 7 is the least suitable for agriculture due to significant constraints such as poor soils, unsuitable climate, difficult topography, excessive stones, etc. In the context of Food and Water First, “prime” farmland is considered classes 1 through 3. Only 5% of Canada’s land mass is made up of prime farmland; only 0.5% is class 1. Ontario’s prime agricultural land is a finite, non-renewable resource comprising less than five per cent of Ontario’s land base. It is the foundation for food, fibre and fur production, the local food economy, agri-food exports, economic prosperity and the growing bio-based economy. The Provincial Policy Statement (PPS) requires that Ontario’s prime farmland remain available for long-term agricultural use, and defines prime agricultural areas as areas where prime agricultural lands predominate. Planning authorities (e.g. municipalities) are required to designate prime agricultural areas in their official plans, including specialty crop areas, Canada Land Inventory Classes 1, 2 and 3 land, and associated Classes 4 to 7 land. Controlling the types and scale of uses that are permitted in prime agricultural areas is an important way of protecting Ontario’s best farmland. April 14, 2018 in Farmland Articles, Reference. This information has been compiled through private amateur research for the purpose of allowing the reader to make an informed and educated decision. While the information is believed to be reliable, accuracy cannot be guaranteed.